Chef Francesco makes his pasta by hand, and his marinara with love and Italian tomatoes. 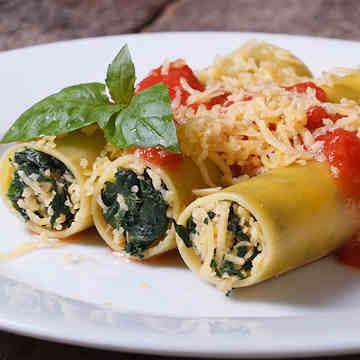 These manicotti are stuffed with rich Ricotta, smooth Mozzarella and salty, sharp Pecorino cheeses, combined with spinach and spices. It's covered with Francesco's famous marinara, more mozzarella, and then baked to fragrant goodness. 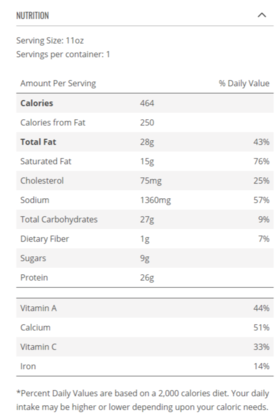 Each serving size includes 2 manicotti, 11 oz. Prepare from THAWED state for best results. When thawed, product can be refrigerated for up to 3 days prior to use. Heating times are approximate and may vary. Bon Appetit! Oven: Preheat oven to 350F. Remove plastic packaging from paper tray. Cover tray with foil and place in oven. Heat for 15-20 min or until warm Remove foil & heat 5 mins longer or until lightly browned.� Carefully place pasta onto a plate and serve. Microwave: Remove plastic packaging from paper tray.� Place tray on a plate in the microwave. Heat for 3-4 minutes until warm Carefully place pasta onto a plate and serve.